Writing a sequel to a well received book is a challenge and Glen Barrera rises to meet the test with a winner. In “A Capable and Wide Revenge” he follows the continuing experiences of his wonderful characters from “The Assassin Who Couldn’t Dance”. Although the characters are familiar from the earlier book, this book stands quite well on its own. Once again former US soldiers, joined by Hector the “assassin” from the first book, are faced with corruption and sadistic enemies who will stop at nothing to achieve their evil goals. Contrasting beautifully with the tightly knit group led by Gil Scott and his Leary Group and Hector Munoz the “assassin”, are greedy and ruthless soldiers and politicians. Exposing the sordid underbelly of world politics Barerra takes the reader on a wild ride through the streets of Baghdad to Miami and Wisconsin while bullets fly and bombs explode. Introducing new and vibrant characters, some good and some very bad, Barrera manages to keep the action realistic. At moments the story is heart breaking. In other parts the action is gritty and visceral raising the tension to a nail biting level. The women in this story are no wilting flowers. Courageous and tough, they also reveal softer and often humorous sides when needed. Throughout the book Barerra subtly addresses the issue of international computer dating and the desperation of those who become involved in the lurid practice. 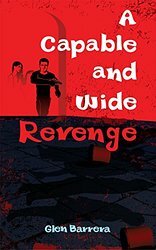 As much a cautionary tale as a heart racing adventure, “A Capable and Wide Revenge” is exactly what the title proclaims. All in all this is a well developed story that held my attention.